It may be time for Canada’s provinces to pass legislation banning medical professionals from prescribing cannabis for medical purposes. Ironically, that may be the only measure capable of stopping a federal moving target dead, and ending cannabis prohibition in Canada. For almost 9 months, Toronto’s Matthew Mernagh has been waiting to see whether the court will dismiss the federal government’s appeal of a 2011 decision that struck-down cannabis prohibition in Canada. 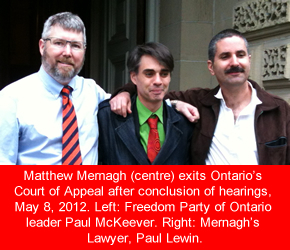 Two days of hearings of the Crown’s appeal of the R. v. Mernagh decision wrapped up in the Court of Appeal for Ontario on May 8, 2012. A list of the decisions released by the Court in January 2013 reveals that almost all of the decisions relate to hearings that have happened in or after September of 2012. The exception: a May 23, 2012 hearing. The court’s decision in R. v. Mernagh has been reserved longer than all of the decisions released by the court so far this year. Call it coincidence, but the court’s delay has given the federal government time to come up with a plan “B” in case it loses the appeal. Plan “B” consists of Marihuana for Medical Purposes Regulations (“MMPR”) proposed in a Regulatory Impact Assessment Statement published in the December 15, 2012 Canada Gazette (Vol. 146, No. 50). In R. v. Mernagh, the trial judge acknowledged that the Canadian Charter of Rights and Freedoms has been interpreted to guarantee medicinal use of cannabis by patients. Mernagh challenged the effectiveness of the federal Marihuana Medical Access Regulations (the “MMAR”) that tell physicans and patients what must be done to prove that an individual is a patient entitled to the use of cannabis. Specifically, Mernagh tendered evidence that physicians far too frequently refuse to sign the paperwork necessary for an individual to prove he/she is a patient and that he/she is therefore exempt from Canada’s cannabis prohibition laws. If the Court of Appeal decides that Mernagh is correct, there will be no law distinguishing patients from recreational users and – as the trial judge concluded – that will imply that Canada’s laws against possession and cultivation are unconstitutional. The implications of the proposed MMPR for the R. v. Mernagh appeal are clear. The court could conclude that – with respect to the constitutionality of cannabis prohibition after the MMPR comes into effect – the repeal of the MMAR renders the issue moot. Specifically, even if the court were to find that physicians too frequently refuse to sign the required paperwork under the MMAR, if the MMPR is brought into force before the court renders its decision, the court would have no evidence upon which to conclude that nurses too frequently refuse to sign the required paperwork; no evidence that, under the new MMPR, patients cannot get the required medical exemption paperwork signed by a medical professional. Therefore, if the MMPR is in effect before the court renders its decision, the court might decide that it cannot conclude that Canada’s cannabis prohibition laws are unconstitutional in the period following the introduction of the MMPR. I offer no opinion on why the court has not yet rendered its decision. The government has announced that “There will be a 75-day comment period and the Department will be receiving comments until February 28, 2013” and that the MMPR is to come into force in the “spring of 2013”. If the court does render its decision as speculated above, it might yet be the case that the court also would find that, for the period prior to the coming into force of the MMPR, Canada’s prohibition laws were unconstitutional. That would allow the court to uphold the trial judge’s acquittal of Mr. Mernagh without ending cannabis prohibition on a go-forward basis. However, it would leave Mr. Mernagh – who cultivates his own cannabis – in violation of the law. To those who – like me – hoped that R. v. Mernagh would spell the end of cannabis prohibition in Canada, I offer one observation, and two proposals. The take-home observation is that the Harper Conservative government – like the Liberal governments before it – is inclined to do just about anything it can to prolong cannabis prohibition. If, in a few years, there is evidence that nurses too are refusing to sign exemption paperwork for patients, we might expect a court action that challenges the MMPR. And we should expect an appeal when the trial judge concludes that prohibition is unconstitutional. And we should expect another suspension of the trial judge’s decision for a year or more while an appeal waits to be heard. And we should expect the Court of Appeal again to reserve its decision for 9 months or more. And we should expect the federal government to introduce yet another Regulation, perhaps allowing paralegals or witch doctors to sign exemption paperwork. Wash, rinse, repeat. In short: the federal government is prepared to keep this game going forever; to keep the regulations in permanent moving-target mode so as to undermine any court-based attack on cannabis prohibition. First, I would respectfully submit that the court should issue its decision as quickly as possible. If it concludes – as I would – that the trial judge was right in his finding that cannabis prohibition is unconstitutional, the public will soon learn that it is free to grow and use cannabis recreationally and medicinally. The longer that genie is out of the bottle, the more normalized and well-accepted will be the recreational and medical use of cannabis. What little political will there remains to continue prohibition may well be defeated. Of course, even if the court were to issue its decision today, the government could implement the MMPR immediately. Accordingly, I am drawn to consider advocating a different, non-judicial proposal: the introduction of provincial laws that ban the prescription of cannabis. In Canada’s constitution, health care laws fall exclusively into provincial jurisdiction. Were provincial law to bar physicians and nurses from signing patients cannabis prohibition exemption documentation, the MMPR – and all such gate-keeper based federal regulations designed to facilitate prohibition – would be rendered ineffective. Consequently, there would be no way for patients to obtain the paperwork they need to distinguish themselves from recreational users, and to exempt themselves from cannabis prohibition laws. As a result, a court would conclude that Canada’s federal cannabis prohibition laws are unconstitutional. The latter proposal should be attractive to all politicians precisely because it is so counter-intuitive. All politicians could advocate banning the prescription of cannabis, for different and opposing reasons. The anti-prohibitionist politician could advocate the provincial ban on prescriptions as a means to end prohibition. The prohibitionist politician could advocate the provincial ban on prescriptions (at least purportedly) as a means to reduce use of cannabis. If the proposal sounds perverse, I agree. But the perversion of such a proposal pales by comparison to the perversion of justice implicit in the never-ending dance between the federal regulators and our courts. The federal government, on this file, is not interested in justice. It is interested only in the prevalence of prohibition. Justice and freedom demand that we turn off the music and end the dance. Assuming the provincial legislature passes such a law, which I doubt would ever happen… what would stop the courts from striking down the provincial laws? This could happen pursuant to a “paramountcy” doctrine, or the fact that the provincial laws frustrate the purpose of federal legislation and regulations. Although healthcare is exclusively within the provinces’ jurisdiction, they are not authorized to pass laws which are colourable attempts at controlling areas that fall within federal jurisdiction. If the impugned provision was merely part of an overall valid legislative scheme it may hold up, but it seems your suggestion is that the sole legislative purpose would be to undermine federal legislation (MMAR, or the impugned provisions of the CDSA ss 4 and 7)… This, you must understand, would fail in court. I am not against your suggestion, I am merely pointing out what came to mind upon first reading your post. Hi Louis. There would be no conflict between the MMPR/MMAR and a provincial law banning physicians from prescribing cannabis. The MMPR/AR does not require a physician to sign anything. The jurisprudence makes that clear. Indeed, the Ontario Court of Appeal’s decision yesterday makes it clear (see Doherty, J.’s decision) that even if every physician were to boycott signing the exemption paperwork, that would not render the MMAR an illusory system and would not render cannabis prohibition unconstitutional. So a provincial law forbidding the prescription of cannabis would not be in conflict with the federal law by way of express contradiction. Moreover, the federal government has no authority with respect to laws concerning health care: it’s an expressly provincial matter. Accordingly, the doctrine of federal paramountcy would not come into play. The purpose of federal cannabis laws routinely are said to be (a) protection of the public from cannabis, and (b) compliance with international cannabis prohibition laws. A law that bans the prescription of cannabis is not inconsistent with either of those objectives. The federal government does have exclusive jurisdiction in criminal matters and, by way of that power, it can and does criminalize cannabis use. A provincial law that bans prescription of cannabis would not itself be a colourable attempt to defeat that purpose. The only thing defeating that purpose, were such a provincial law imposed, would be the constitution itself. The MMPR appears to recognize that fact: it would extend to nurses the power to sign exemption paperwork only in provinces or territories “…where supporting access to marihuana for medical purposes is included under their scope of practice or in legislation…”. In other words, even the regulation itself anticipates that the province has the right to determine the scope of a medical professional’s practice, even if that means stymying the MMPR’s purpose. As for the legislative purpose of a prescription ban: I’m writing a blog entry, not a bill. Presumably – as is the usual case when the legislature is trying to offend individual life, liberty, and property with laws – the politicians penning such a bill would provide an up-with-prohibition purpose, or a “but what about the safety of the children” purpose, or a “we must prevent the spread of schizophrenia” purpose, or any of the wide range of lies currently sitting on the legislative shelf, regularly put forward as excuses for any number of violations of freedom. Banning private sale of liquor? : “To prevent minors from getting access”. Keeping highway speeds at 100 kph? : “Speed kills” (even though the reduced speed limits were brought in to reduce fuel consumption during a 1970s oil embargo). Workers compensation? : “So that workers are protected in case they are injured at work” (even though they lose their right to sue their employer, and the high-injury business gets its premiums subsidized by the low-injury businesses, etc.). “Colourable attempt”? That’s up to the whims of the court, given that so many laws obviously are introduced on false pretences. So, yep, the court could strike such a law down, just as it could find a way to strike any law down. The law is a malleable tool. Those who hold the power decide its shape. Philosophy bends the law, and only philosophy – and the will that results from ones philosophy – determines the political fate of man. Still, the laws we’re talking about are not about ensuring justice. They are about legitimizing the incarceration of people who are hurting nobody (except possibly themselves). And, it appears, they are about ensuring that man-made drugs have a demand and price that they would not otherwise be able to command. Just as dishonesty and evil is the foundation of probibition laws, it strikes me as nothing but good for a legislator to use the same sort of dishonest representation of purpose so as to effect justice. All of that said, you’ve given me an idea: medical professionals should be encouraged to form associations that voluntarily refuse to sign the paperwork. Consider the words of Justice Doherty just yesterday in the R. v. Mernagh appeal in Ontario’s court of appeal: “If…the evidence [had] established that the medical profession was refusing en masse to participate in the MMAR, that would not necessarily make the defence illusory in the relevant sense.” Let the court try to assert that such a voluntary boycott, by non-governmental actors, is a colourable attempt to do anything at all. Such an assertion would have the effect of asserting that a boycott by doctors would – contrary to what Justice Doherty wrote – render the MMRP an illusory defence, and the cannabis prohibitions unconstitutional.